100% AUTHENTIC. GREAT ITEM FOR PERSONAL USE. Genuine item have part used this but have gone back to Chanel number 5. well over half left. Check photographs re content. PART USED 50ML BOTTLE CHANEL NO 5 EDT SPRAY. This is a Coco Chanel Eau De Toilette 50ml, it is an oriental-floral fragrance with fresh tones. A luxuriant yet light harmony that leaves behind a trail of scent tinged with Indonesian Patchouli. Chanel Coco Mademoiselle & No5 Twist & Spray Purse Spray Canister. Empty. Condition is Used. Dispatched with Royal Mail 2nd Class. Chanel Paris No 5 L’eau Boxed Bottled Miniature 1.5ml Collectors Item EDT. Condition is New. Dispatched with Royal Mail 2nd Class. Half Filled Bottle of Chanel Allure. Eau De Toilette. Half Full Chanel Chance Eau De Parfum - 50ml. Condition is Used. Dispatched with Royal Mail 2nd Class. Can’t change item specifics but it is definitely a 50 ml bottle and eau de parfum. Almost Full Bottle of Chanel Allure. Eau De Parfum. Chanel chance perfume. I was gifted this and opened it and have only used it a handful of times as I have other perfumes that I prefer. There must be at least 95ml left. It will be sent signed for delivery. CHANEL CHANCE Eau de Parfum Spray 50ml. Dispatched with Royal Mail 2nd Class. Have used a few times but just too strong for me as I prefer the eau tendre version of the perfume. Coco Chanel Mademoiselle 50ml Eau De Parfum. Condition is Used, I purchased this in February from the House of Fraser perfume counter in Bristol, but since failing pregnant I don’t like the smell of the perfume on my skin! Only used a handful of times and there’s more than 3 quarters of the bottle left! Chanel Coco Mademoiselle Eau De Parfum 100ml. Used few times. Condition is Used. I’m not too sure if is genuine as that was a gift Dispatched with Royal Mail 2nd Class. Chanel Coco Mademoiselle Twist and Spray Eau De Toilette Refill. Quick dispatch with Royal Mail 1st Class. CHANEL Pour Monsieur 75ml Eau De Parfum. Not a lot required as this is way de perfume NOT Eau de toilette. Just over half full. Dispatched with Royal Mail 2nd Class. No returns. Chanel Chance Eau De Toilette Spray 100ml (left 30 ml). Spray on skin or clothes. This Stunning Classic Signature Chanel fragrance is in a concentrated oil Elixir of the original No 5 blend. This fragrance has been kept in a cool dark place in a box. There are very few of these available anymore so do not miss out on this rarity. Unsealed , used a little bit Opened , Extremely Rare Vintage Chanel A Gentlemans Cologne Genuine. Condition is Used. Dispatched with Royal Mail Signed For® 2nd Class. The atomiser is easily refillable once empty. Basenotes are tonka bean, patchouli, opoponax, vanilla, vetiver and white musk. Middle notes are mimosa, jasmine, turkish rose and ylang-ylang. Orange, mandarin orange, orange blossom and bergamot. COCO CHANEL Mademoiselle Eau De Toilette Vaporisateur Spray 50ml . Condition is New. Dispatched with Royal Mail 1st Class. AUTHENTIC CHANEL COCO MADEMOISELLE Eau de Parfum 100ml Spray Used. Condition is Used. Dispatched with Royal Mail Signed For® 2nd Class. CHANEL MISIA Eau de Toilette 4ml/0.12fl.oz. CHANEL SYCOMORE Eau de Toilette 4ml/0.12fl.oz. 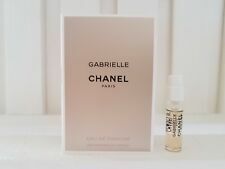 Chanel Coco Mademoiselle Eau De Parfum 100ml - New Sealed. Chanel rare envelope inside Chance sample,pen booklet,card.Perfect condition,envelope closes with black ribbon. ( which chance is yours take it). CHANEL BEIGE Eau de Toilette 4ml/0.12fl.oz. No5 L 'eau. Used twice but not my favourite. GENUINE COCO CHANEL REFILLABLE ATOMISER BLACK & GOLD CASE WHICH HOLDS AN EMPTY 60 ML BOTTLE. THE BASE COVER SLIDES OUT IN ORDER TO REPLACE THE BOTTLE. CHANEL Parfums. VIP Gift From Chanel Parfums, not for sale. 3 x Stamper 1 Black Ink Pad : Size - approx. 2.5 x 2.5cm x 2cm. Limited For Chanel Lovers. New in Box. VTG "No 5" PERFUME EXTRACT BY CHANEL Paris - 🇫🇷 NO Box!